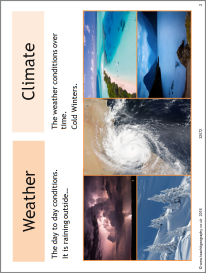 A simple PowerPoint resource to help students understand the difference between weather and climate. Students are asked to write developed sentences to describe the weather and climate of their area. There is an opportunity for self assessment of their written work.